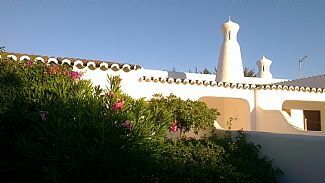 Casa Vinha Velha is a beautiful 3 bedroom (all ensuite) villa situated 30 miles to the west of Faro, close to the quiet village of Carvoeiro with its lovely beaches. The villa boasts air conditioning, a private pool (which can be heated at a cost of £125 per week), a bbq area and stands in 0.5 acre of mature gardens. The property is private and secluded yet just a short walk from shopping and leisure facilities including tennis, golf and many bars and restaurants. 2 bedrooms include en-suite shower rooms and the other bedroom has an en-suite bathroom. Pay as you go dongle. Spacious living/dining room with log burning stove, satellite TV, DVD, French windows lead to terrace & pool area. Large fully fitted kitchen with dishwasher, cooker, microwave, etc. Golf Club & Tennis club are located nearby. Pool can be heated at a cost of £125 per week. Notes on accommodation: Air conditioning throughout. The Property is located on the ground floor, so wheelchair access is available throughout. Outside: 0.5 acre of mature gardens, terrace with sun loungers, swimming pool with lighting, steps to roof terrace, ample parking. Utility Room: Laundry room. Cleaning / Towels / Linen / Maid service: The property has plenty of towels, bed linen etc. A great Villa. The Portugal people are very friendly & appreciate the tourists visiting. Wonderful Villa. We arrived early spring March 27th. Weather co-operated all but a few days. First arrivals for the season hence no condiments but we enjoyed the welcome gift to tied us over until we could get groceries etc. Bought an ice cube tray. They need to update kitchen knives for cutting. Drain under sink is open?? This would not be allowed in other countries. We were assisted by Kevin the property manager whom was great with information about the villa etc. Thanks kevin. Overall a great villa. You may want to rent an auto which we did to explore the Algarve. We felt totally at home as soon as we went into the villa. The welcome pack was excellent and the villa was spotless. This year we had the pool heated. It was gorgeous - just like getting into a big bath. Found more wonderful places to eat close by. We couldn't have asked for more. I'm sure that we'll be returning. Had an amazing holiday here. We’ve been to Carvoeiro quite a few times now and this was the best! The villa has everything you need and is lovely inside and out (beautiful gardens). 3 on-suite bedrooms and a large comfortable lounge/dining area and everything you need in the kitchen. The pool and surrounding area is perfect. We went in August and were unsure whether to have it heated or not - definitely didn’t need it as it was just right after lying in the hot sun. Joyce, the lovely owner was really good and answered all the questions we had promptly before the holiday. The villa is in a nice area and it doesn’t take too long (20-25 minutes) to walk into town. There are a couple of very nice reasonably priced restaurants within crawling distance. Kevin, who is in charge of maintaining the properties came to see us on the second day, really nice man and told us everything we needed to know. Helena the maid was just like one of the family and the pool cleaning man was very friendly and spoke great English. Would recommend this villa to anyone and would love to go back! Thank you so much for a lovely review of our property and staff, so pleased you enjoyed your holiday. We stayed at this villa for two weeks in July 2018 with our two little boys (5 and 2) and my parents for the second week. We had plenty of space, loved the layout being all on one floor and the fact that all the bedrooms had their own bathrooms. We paid for pool heating and that was definitely worth having. We walked in to town most days but it is quite a decent journey especially in the heat. The second week we used Uber quite a lot and found it to be reasonably inexpensive. The maid service was fantastic and really helps to enjoy a relaxing holiday not cleaning floors every other day. The only small point for us was the internet was pay as you go. This wasn't mentioned anywhere I could see in advance of arriving at the villa which I think would be helpful, The agent was more than helpful and someone called round to check we had found everything we needed. Thank you for such a lovely review - so glad you enjoyed your stay. Well equipped and very private villa in an excellent location. Walking distance to all amenities, bars and eateries to suit every taste. Ideal to relax and explore the surrounding area - looking forward to another stay! Thank you for a wonderful experience with first class and personal service. Greeted by an very comprehensive welcome pack covering all our basic needs inc a bottle of wine ! the scene was set for a most enjoyable and relaxing holiday. Well appointed, very comfortable, airy, with a cracking pool area and a terrace to sit out of the sun if required. Thank you for such a lovely review of our home in the sun - so glad you had an enjoyable time. The coast is just 5 minutes walk away. Faro airport is 40 minutes drive. Carvoeiro town is 15 minutes walk away - through the holiday resort and apartments. There are plenty of restaurants, shops, banks etc within 15 minutes walk of the villa. Booking Notes: 50% deposit required, to confirm booking of the villa, with the balance due 4 weeks prior to your holiday. Pool heating is available at £100 a week. A £250 retainer deposit is required a week before your holiday by cheque or Bank transfer. Check in time 3pm. Check out time 10am. Notes on prices: Prices are for property per week in UK Pounds.